Schur functions provide an integral basis of the ring of symmetric functions. It is shown that this ring has a natural Hopf algebra structure by identifying the appropriate product, coproduct, unit, counit and antipode, and their properties. 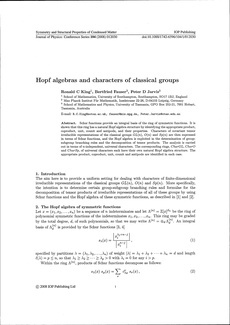 Characters of covariant tensor irreducible representations of the classical groups GL(n), O(n) and Sp(n) are then expressed in terms of Schur functions, and the Hopf algebra is exploited in the determination of group-subgroup branching rules and the decomposition of tensor products. The analysis is carried out in terms of n-independent, universal characters. The corresponding rings, CharGL, CharO and CharSp, of universal characters each have their own natural Hopf algebra structure. The appropriate product, coproduct, unit, counit and antipode are identified in each case.